Growth in demand across Asia dominated headlines this winter as China in particular posted strong import volumes compared to previous years. However, demand is starting to soften this spring, along with seasonal trends, according to Jeff Moore, Manager, Asian LNG Analytics. As demand in Asia declines seasonally, it is pulling the Platts JKM price benchmark lower. Meanwhile, Europe looks to restock more volumes as storage stocks were pulled to record lows toward the end of the winter. If the JKM links to hubs such as the TTF or NBP to allow more LNG volumes for injections into European storage fields, it could imply the JKM decoupling from Brent this summer to levels not seen for years. For more information on Platts LNG Analytics, call 1-855-713-0658. Today we’ll take a look at the recent softness in the Asian demand markets which is being offset by strength in the European markets as they look to rebuild stocks. A late-season cold spell pulled LNG and underground storage and in Europe to record lows. The situation is likely to help support European hubs this summer, such as the NBP and TTF, to bring in additional LNG cargos, while JKM prices could see further decoupling from Brent. China presented itself as the main driver of demand growth year-over-year, importing 7.3 million tonnes more LNG this past winter compared to the previous winter. This represents growth of 34% winter-over-winter. Lack of significant storage capacity forced China to enter the spot market as a strong buyer this winter to help meet their demand and helped send the Platts JKM benchmark spot price to its highest level since late 2014, peaking at $11.70/MMBtu on January 15 of this year. However, as we are now moving into the shoulder season, we’re seeing demand in Asia start to slow down significantly. Last summer, we saw a fairly significant increase in Chinese LNG demand, with total imports growing by nearly 40% summer-over-summer. However, that’s not necessarily going to happen again this year. Although we expect China to continue to buy cargos above their contracted capacity, our forecast for LNG demand in the country shows imports slowing down to around 10% year-over-year growth this summer, which is a far cry from the massive gains they posted last year. Furthermore, the storage situation in neighboring South Korea and Japan is not outside seasonal norms, and it’s likely we won’t see significant injection demand from either country until further this summer. So what does this all mean for prices? Well, the JKM benchmark spot prices are now trading close to $7.00/MMBtu to start the month of April, finding support at this level. 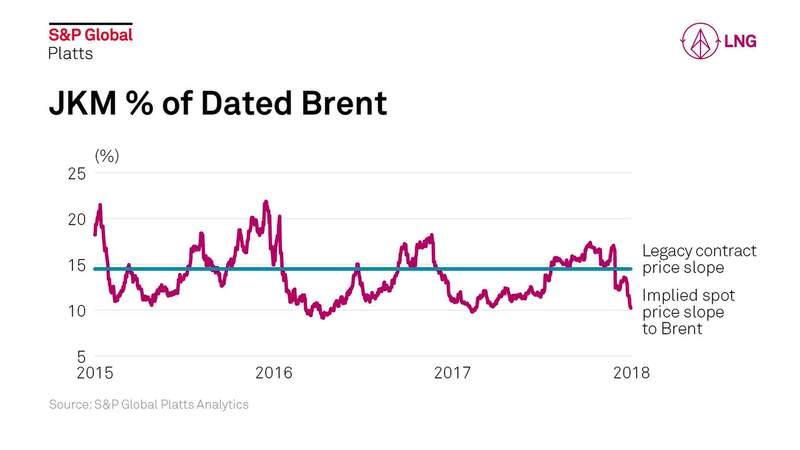 This seems to be key zone to watch, as it implies that the slope of JKM prices compared to dated Brent have fallen to around 10%, which represents a relative minimum for the relationship between the two price benchmarks. This isn’t outside the norm for this time of year, as the implied slope between the JKM and Brent benchmarks typically falls close to 10% in the spring. However, as Brent prices continue to increase, it’s possible we could see further de-coupling from the JKM as it moves close to the TTF or NBP. Our JKM price forecast implies that we will see the lowest implied slope compared to Brent over the course of the summer in nearly a decade! This would especially hold true if the JKM links to European prices and we see any further softness this spring. We will be following this story closely as we analyze the markets and fundamentals around the globe. Until next time on Snapshot, we’ll be keeping an eye on the markets.